Make the eggplant cream Roast the eggplant directly over a gas flame or broil 6 inches from the heat until charred all over and very tender, 15 to 20 minutes. Transfer to a plate and let cool completely. Peel and seed the eggplant. In a blender, combine the eggplant flesh with the canola oil, garlic and lemon juice and puree until very smooth. Transfer to a small bowl and season with salt. Make the freekeh In a large, deep skillet, heat the olive oil until shimmering. Add the onion and a generous pinch of salt and cook over moderate heat, stirring occasionally, until lightly browned, about 10 minutes. Stir in the freekeh, cumin and baharat and cook until fragrant, about 2 minutes. Add the boiling water, cover and cook over low heat, stirring occasionally, until the freekeh is al dente and the water is absorbed, about 1 hour. Stir in the lemon juice and preserved lemon peel and season with salt. Meanwhile, make the parsley sauce In a medium saucepan of boiling water, blanch the parsley until tender, about 4 minutes. Drain well and transfer to a blender. Add 1/4 cup of cold water and puree until very smooth. Season with salt. Make the chipotle sauce In a blender, combine the lemon juice, canola oil, chipotles, ginger, soy sauce and honey and puree until very smooth. Season with salt. Make the fish Season the fish with salt and pepper. In a large nonstick skillet, heat the canola oil until shimmering. Add the fish, skin side down, and press gently with a spatula to flatten. Cook over moderately high heat until the skin is browned and crisp, about 3 minutes. Flip the fish and cook until just opaque, about 2 minutes. Transfer to a plate. Spoon 2 tablespoons of the parsley sauce into shallow bowls. Spoon the eggplant cream on top, then the freekeh. 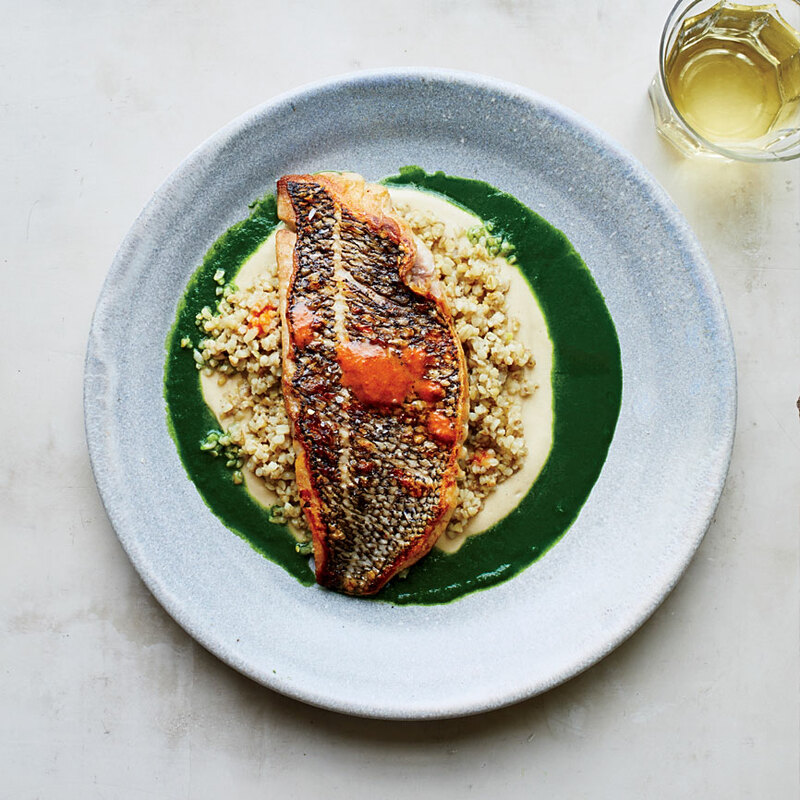 Set the fish on the freekeh skin side up and drizzle with the chipotle sauce. Serve, passing more chipotle sauce at the table. The eggplant cream, parsley sauce and chipotle sauce can be refrigerated, separately, overnight. Bring to room temperature before using. Baharat spice blend commonly includes black pepper, cumin and cinnamon, and is available at kalustyans.com. Review Body: I'd leave the eggplant out of the equation and voila!